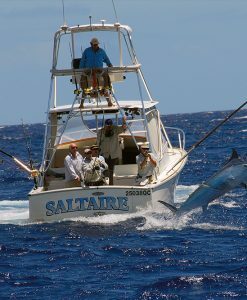 Heavy Tackle Game fishing from Port Douglas targets the mighty Black Marlin and other billfish. In September every year the giant black marlin females return to the Great Barrier Reef waters off Port Douglas to breed. These big girls chow down on the fish rich waters of the Barrier Reef and lay on fat so that after they mate, they can spawn. The reliable and predictable return of these mighty game fish every year means that the heavy tackle game fishing from Port Douglas is second to none. These massive fish, also known as “granders” (1000 lbs or over) are the target of heavy tackle game fishing activities from Port Douglas. Taking on one of these big girls will punish you. Heavy tackle game fishing requires a reasonable amount of fitness. Baits are predominantly used for heavy tackle game fishing for giant Black Marlin. 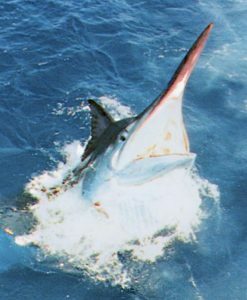 The preferred technique for heavy tackle fishing for the giant Black Marlin is to troll whole fish baits such as Scad, Queenies, Rainbow Runner, Yellow fin or Mack tuna and Scaly Mackerel. The “baits” are quite sizable for heavy tackle fishing- some of them are up to 30 lb! Big baits for big fish. The baits are rigged to either skip across the surface or swim between the surface layers. Heavy Tackle skip baits generally are around 12 to 15 lb and swim baits lighter- around 1- 5 lb. 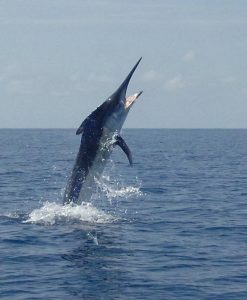 When heavy tackle fishing from Port Douglas it is a preference to tag and release Marlin caught. Heavy tackle game fishing for these monsters requires heavy duty gear. 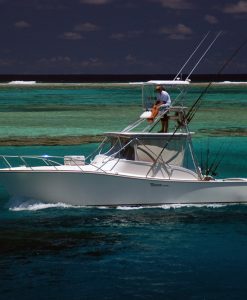 You will find that on most heavy tackle game fishing boats the crew use Shimano and Penn and gear.When heavy tackle game fishing, the game fishing boats troll two to three rods at one time from the outriggers. Sometimes they troll lures from additional rods. You can do some heavy tackle game fishing from Port Douglas in one of two ways. 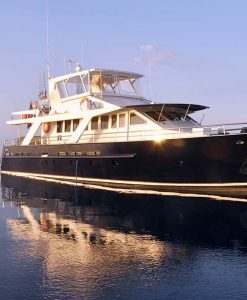 If you want the creature comforts and you want to do luxury heavy tackle game fishing then you can charter a mothership. The mothership is like a floating 5 star hotel. Motherships do not usually have the speed or maneuverability required for heavy tackle game fishing. Heavy Tackle fishing from motherships involves the mothership anchoring inside the reef while you fish from the game fishing boat each day. The mothership is also able to move along the inside of the fishing grounds to where the fishing action may be each day. 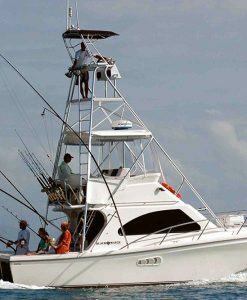 This means that on extended charter your heavy tackle fishing time is maximized as you don’t need to travel far to the marlin grounds from the mothership each day. When chartering a mother ship for heavy tackle game fishing you will also need to co-charter a smaller game fishing boat. These heavy tackle game fishing boats return to the mothership at the end of the day. 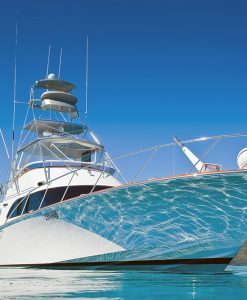 Starting prices for heavy tackle motherships are $6600 per day. 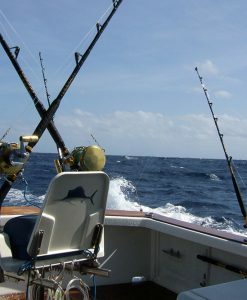 Starting price for heavy tackle game fishing boats are $2200 per day. 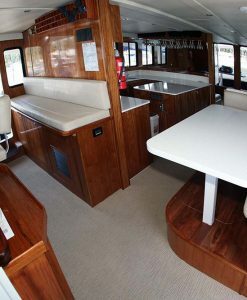 You can also do heavy tackle game fishing from Port Douglas on a single day charter. 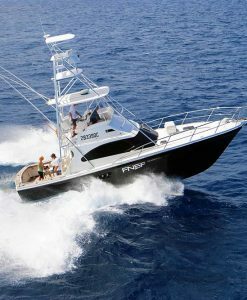 Prices start at $2400 per day for heavy tackle game fishing charters.